Vonage USB SoftPhone kit or V-Phone is a USB key-chain device that can be plugged into any USB port on any Windows-based computer to provide instant Internet calling from your VoIP number or receive call on the number at the same low price across the world. The Vonage USB SoftPhone kit consists of a USB key that preloaded with Vonage software with your account ID and its own jack for standard cell-phone earphones plus a headset. Once the USB Key VoIP phone been plugged into any PC, the software will run and let you make and receive the call with your Internet telephone service. WRAL reviews the Vonage USB SoftPhone telephony set and concludes that this product is being positioned as a mobile tool, particularly for the business users Vonage has struggled to attract. It’s not being marketed as a replacement for the standard home-based Vonage adapter that connects a phone with the broadband line and rarely gets unplugged. This new product is in fact novel. It made mobile Internet-based calling enough of a snap that it could easily change user behavior, possibly driving more usage or stealing minutes from cell phones. With the automated setup and single-prong jack, it takes a simplifying leap past existing devices, including some USB drives that run eBay Inc.’s popular Skype service or the VoiceStick from i2Telecom International Inc. 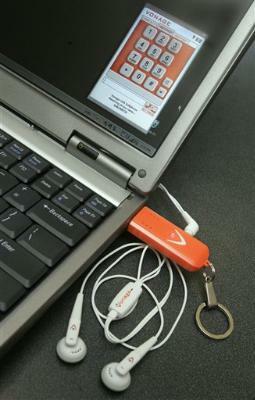 Check out review by TMCnet on Vonage USB SoftPhone.